✅ Trip Verified | Transit for 5 hours, never ever at SAW airport. Rude ground staff do not speak English, basic words only. Not helpful at all, shouting at people if they do not understand, no patience or willingness to help with even basic needs or requests of travellers. Arrogant staff at security check mostly busy by talking with other colleagues. Wifi costs 3.9€ and works properly for one hour, not two as mentioned when you pay. Whenever you are going to your terminal downstairs you lose wifi signal, so basically wifi works on the main floor of the airport only. Restaurant and cafe shop staff speak very basic English, literally see them get upset when they have to serve you. There are not enough seats and they are not comfortable at the airport. I arrived during the morning rush hour and the airport was incredibly busy. Toilets were clean, maintained by the cleaning lady regularly. Maybe I got lucky this time. I understand the cultural differences but would be nice if the airport staff treat you with manners. ✅ Trip Verified | No free wifi. This is incredible, no free wifi in 21st century. Security at boarding gate shouted at a customer who did not understand what they were saying and insulted her. No free wifi, you cannot connect to tell your family you are safe. If you do not have phone services active in Turkey you would see that is quite handy. Horrible greedy management. Not Verified | Well where to start. In overhaul; unhelpful staff, no one speaks English, although I speak some Turkish were not interested in helping. Security screen at entry; rude and impolite security officers. TK self-checking counters, no one spook English and not interested in helping. Travelling with one hand luggage only, it took me 20 minutes as priority Star Alliance Gold traveler to check-in and lost my flight due that. TK counter; poor English while rebooking my flight. Gate; same nobody speaks English there. ✅ Trip Verified | I have been at this airport many times. In all the big airports in Turkey, I think this is the superior one. Always crowded but always works like clockwork. You have the same shops big airports offer and same price points which are expensive anyway. Although so crowded it is clean and waiting lines moving fast. You have a lot of transportation choices to and from the airport. Seats are good enough for waiting two or three hours. Better than bare metal seats that Ankara Airport has. ✅ Verified Review | Worst airport experience so far. Traveling from Antalya to London by Pegasus via Sabiha. Firstly to transit you need to exit airport and then enter it for international departures. No indications at all, and on our inquiry on Pegasus counter in baggage area, a young lady shouted on us, in quite a rude way, that we should exit first. So we need to wait to pass full baggage and passport control (hopefully we have 3 hours). Airport was crowded and has no special waiting area, so you could wait either at gate or in numerous fast food restaurants (all crowded) at sitting at floor as many others. No complimentary drinking water. And as a bonus, there was another long baggage control at the gate, with opening bags and pat downs. Asking a reason, we were told that it was required by London. So quite a mess and nonsense. Avoid by any means. ❎ Unverified | Well where to start. Unhelpful staff, no one speaks English, although I speak some Turkish were not interested in helping. Could not find gate and staff not interested. Signage useless, even when you understand the language. Transiting through airport to catch flight to N Cyprus told had to buy transfer visa £20 although I know I don't need one, but staff insisted. Rip off, giving bad name to country and airport. Bad reviews mean tourists will avoid this airport. Staff training needed, basic English needed. Employ people who want to do the job and not standing around gossiping. Bring someone in and ask them to find their way to different gates when there is no gate numbers on information boards. Toilets dirty. ❎ Unverified | Our Pegasus flight touched down at SAW 25 minutes ahead of scheduled time. We were lucky as we needed only approximately, 10-15 minutes from the aircraft door until we cleared the immigration counter. There were 5 counters serving the arriving passengers, so the line moved quickly. It took another 10 minutes until we got all our suitcases from the belt and another 10-15 until we got our last checked baggage (oversized one from another belt). Add another 15 minutes more and we were already on our way to Istanbul Ataturk Airport which took almost precisely 2 hours by private shuttle. The airport provided electric wheelchair for our party at no extra cost, sadly the operator spoke no english. ❎ Unverified | Flew to and from Tirana, Albania through Sabiha. First experience after many at Ataturk Intl visits. Pleasantly surprised, international departure was busy but moved quickly. The terminal is close to gates, comfortable seating. 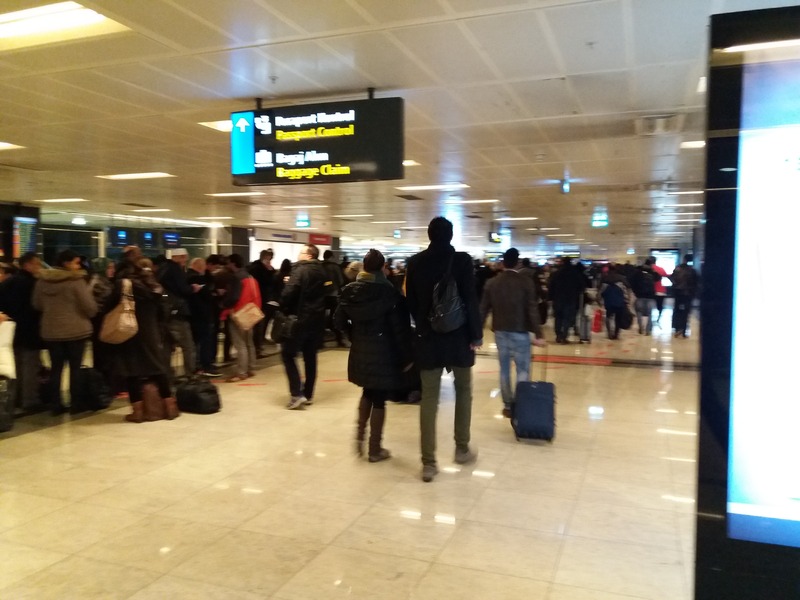 The return to the airport was much more efficient through customs and luggage pickup versus Ataturk. The drawback with all airports in Turkey is the wifi issue, forcing passengers to have an active simcard to receive a text message with wifi code. I use a data hotspot and data apps for keeping in contact with loved ones, which means no internet in Turkish airports. 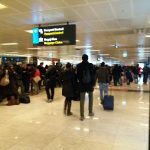 "gotten worse in the past four years"
✅ Verified Review | I have been transiting Sabiha Gokcen to travel to Georgia since 2013 and it has only gotten worse in the past four years. The only English speakers at Sabiha Gokcen are English-speaking passengers. I have never met a local who works at this airport who speaks English - even in the lounge! The toilets are perpetually filthy with water all over the floor because transiting passengers do their ablutions using the sink. It is quite a site to see several guys washing their feet in the sinks. As other travellers have noted there is never enough seating so sitting on the floor is common. And as other passengers have noted, there is no free Wi-Fi. Some shops will give you a temporary internet code (1 hour) if you buy something from their shops. I really like Turkish Airlines (excellent economy-class meals, modern fleet that is well maintained, well-trained pilots) but Turkish airports are just awful - whether Sabiha Gokcen or Ataturk. The English-speaking seatmates I've had on Turkish Airlines flying to/from Turkey are in agreement that Turkish Airports are overcrowded, poorly managed, poorly staffed, and in dire need of outside help to better understand their international passengers. "staff do not speak English well"
❎ Unverified | I passed through Istanbul Sabiha Gökçen airport on transit twice, several hours each time. The airport staff do not speak English well what makes it difficult to understand them. There is no free WiFi at the airport. The airport is small and is very very crowded beyond its capacity. What makes it very unpleasant and there is no place to seat at the food court. All flights were late at their departures.